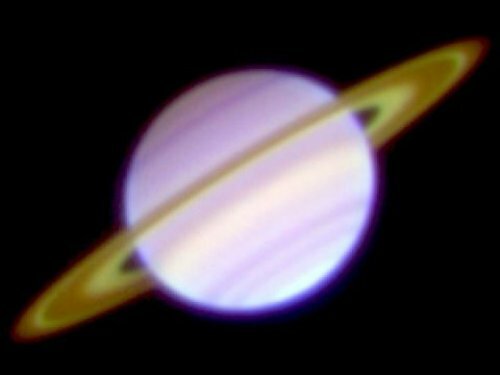 A team of researchers has succeeded in measuring the brightnesses and temperatures of Saturn’s rings using the mid-infrared images taken by the Subaru Telescope in 2008. The images are the highest resolution ground-based views ever made. They reveal that, at that time, the Cassini Division and the C ring were brighter than the other rings in the mid-infrared light and that the brightness contrast appeared to be the inverse of that seen in the visible light. The data give important insights into the nature of Saturn’s rings. The beautiful appearance of Saturn and its rings has always fascinated people. The rings consist of countless numbers of ice particles orbiting above Saturn’s equator. However, their detailed origin and nature remain unknown. Spacecraft- and ground-based telescopes have tackled that mystery with many observations at various wavelengths and methods. The international Cassini mission led by NASA has been observing Saturn and its rings for more than 10 years, and has released a huge number of beautiful images. Saturn’s main rings consist of the C, B, and A rings, each with different populations of particles. The Cassini Division separates the B and A rings. The 2008 image shows that the Cassini Division and the C ring are brighter in the mid-infrared wavelengths than the B and A rings appear to be. This brightness contrast is the inverse of how they appear in the visible light, where the B and A rings are always brighter than the Cassini Division and the C ring. “Thermal emission” from ring particles is observed in the mid-infrared, where warmer particles are brighter. The team measured the temperatures of the rings from the images, which revealed that the Cassini Division and the C ring are warmer than the B and A rings. The team concluded that this was because the particles in the Cassini Division and C ring are more easily heated by solar light due to their sparser populations and darker surfaces. On the other hand, in the visible light, observers see sunlight being reflected by the ring particles. Therefore, the B and A rings, with their dense populations of particles, always seem bright in the visible wavelengths, while the Cassini Division and the C ring appear faint. The difference in the emission process explains the inverse brightnesses of Saturn’s rings between the mid-infrared and the visible-light views. It turns out that the Cassini Division and the C ring are not always brighter than the B and A rings, even in the mid-infrared. The team investigated images of Saturn’s rings taken in April 2005 with COMICS, and found that the Cassini Division and the C ring were fainter than the B and A rings at that time, which is the same contrast to what was seen in the visible light. The team concluded that the “inversion” of the brightness of Saturn’s rings between 2005 and 2008 was caused by the seasonal change in the ring opening angle to the Sun and Earth. Since the rotation axis of Saturn inclines compared to its orbital plane around the Sun, the ring opening angle to the Sun changes over a 15-year cycle. This makes a seasonal variation in the solar heating of the ring particles. The change in the opening angle viewed from the Earth affects the apparent filling factor of the particles in the rings. These two variations — the temperature and the observed filling factor of the particles — led to the change in the mid-infrared appearance of Saturn’s rings.